Hi everyone! It's Angie here from The First Grade Scoop! It's been FOREVER since I've blogged... Holidays get crazy, don't they? 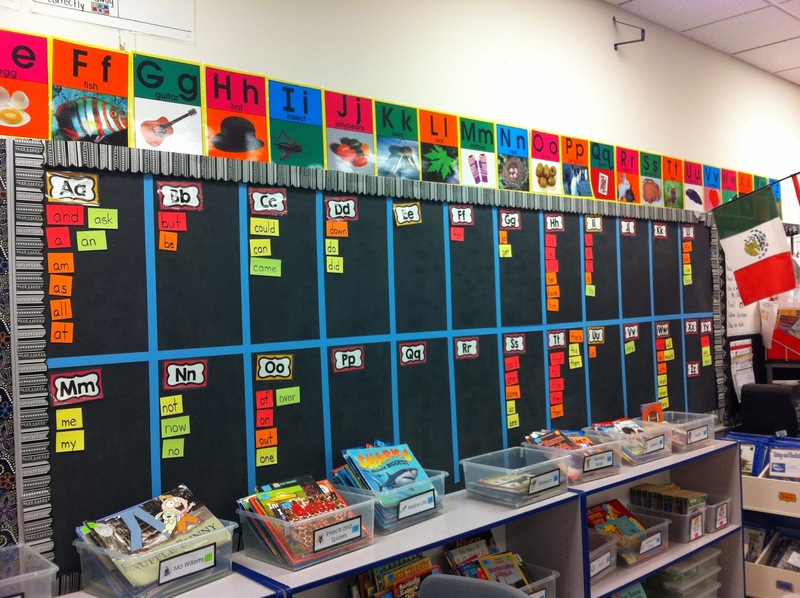 Anyways, I'm back here to share a little bit about our class word wall with you! 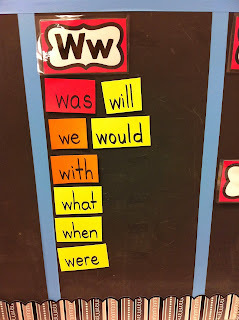 Over the years, I've tried many different ways to organize our sight words on our word wall... And I think I've finally hit on a way that I love! I have an old chalkboard on one side of the room, which I split into sections with colored masking tape. I put X, Y, and Z together... Not like we really have any X or Z words (except zero) to display! I used to type, cut, laminate, then cut again each word, and I changed them for different color themes or when the masking tape I'd hang them with ruined the backs... That took me FOREVER! This time, I used bright cardstock, cut it into two inch strips, then wrote the words by hand, cutting between each. Since they are on a chalkboard, I used peel-and-stick magnetic dots from Lakeshore to hang them. My letter cards are laminated, and the dots don't stick well to those, but they stick to the plain cardstock just fine. 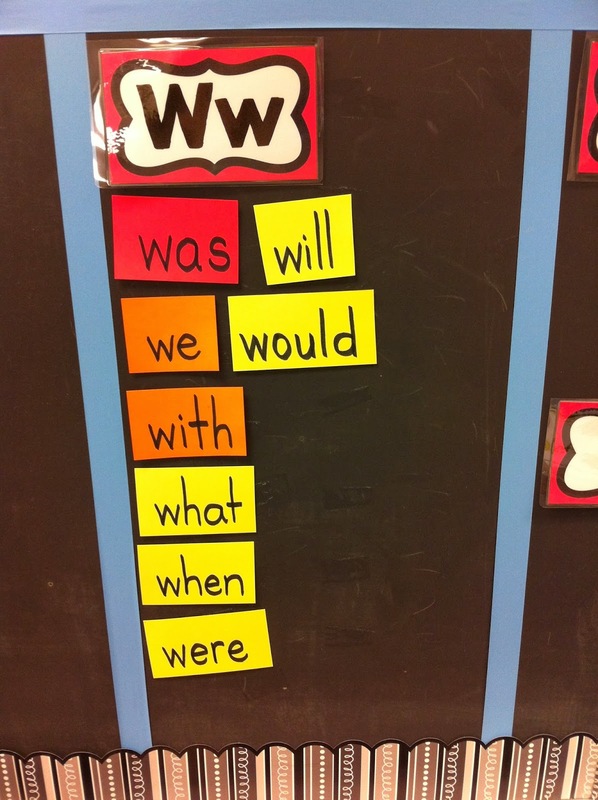 The beautiful thing is that the kids can come pick a word off the board if they need it, then return it. And the lack of glossiness makes it easier for all my students to see. Why all the colors? 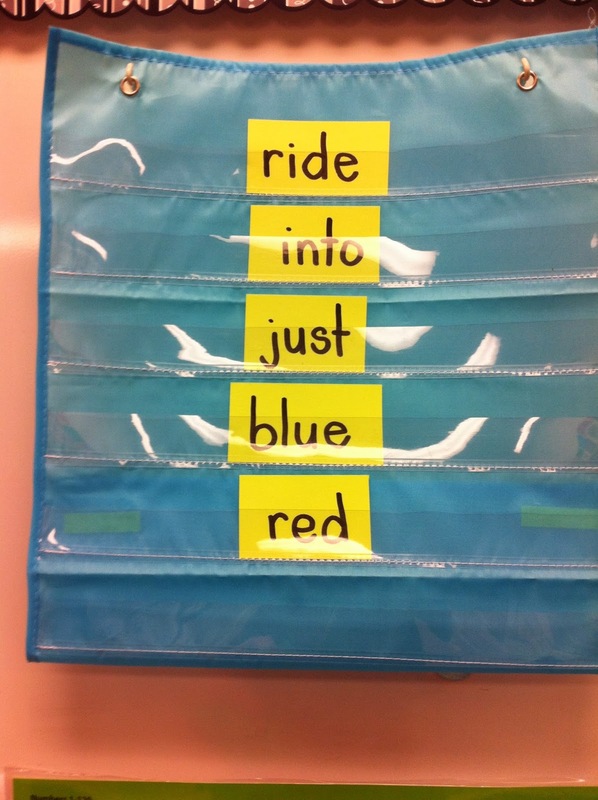 When I teach word wall words each week (students are tested for spelling of five of them weekly), I go off my Sight Word Practice Book lists. 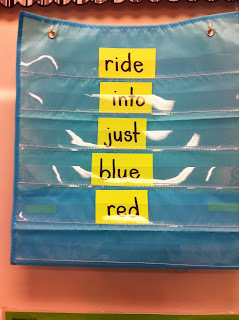 This means my students get the most common words first. Each list of words is on a different color, in order of the rainbow, so List 1 is in red, List 2 in orange, etc. We're finishing List 4 now, so I've used lime green. This helps the kids (and me!) know how long the word has been up there... Helping them to visually distinguish between old words they should be spelling correctly and newer words they might still need to reference. At the end of the year, my words go into coupon accordion folders by week they'll be used, and voila! Easy organization.